I caught Iran-born Norway-based choreographer Hooman Sharifi's new full length work God exists, the Mother is present, but they no longer care tonight. Using texts from philosophers including Nietzsche, Barthes, and Handke, as a starting point, Sharifi has created a performance which he calls "a scream about the violence separating us from a world to which we would love to belong". Admittedly, Sharifi is in dangerous territory (no pun intended) with this work. Violence is a very commonly used themes in dance creation and so a choreographer deciding to take it on needs to be absolutely sure that they have something new to contribute to the dialogue, lest their work just end up being another pile of clichés. 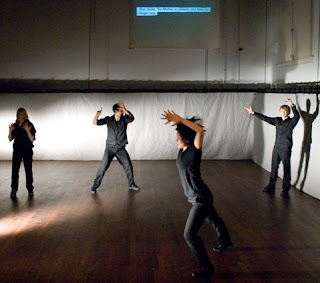 The group of four dancers clad in black perform a blend of choreography that's reminiscent of a theatre school movement class; Mostly very literal depictions of the theme of violence (i.e. swinging swords, throwing spears, launching arrows) as well as the obligatory faces frozen in silent screams. A video camera pointed at a square on the floor of the space projects images of text placed in front of it onto the screen. These include quotes from his source material about violence and power, (i.e. "Violence can take away power, but it cannot create power"). This might have been forgivable if Sharifi wasn't taking himself so damn seriously here, but the utter lack of humour about the clichés that he's putting on stage in front of us is a serious pitfall of the work. The one thing that his seriousness does betray is that he honestly believed that in creating this work he had something new and incredibly important to say. Given his biographic details as a refugee who fled the state of Iran under persecution, I think he would definitely have a perspective on violence far different from Western born choreographers tackling the subject whose experiences are limited to what they've read about or seen in films. With that in mind, I would have hoped Sharifi could have offered me a perspective that was totally new and enlightened, but unfortunately, this work is neither. Though his use of video is moderately interesting, there was a whole world of potential with the camera that he didn't explore. Similarly, the lighting design which leaves one of the rigs suspended by cables mere inches above the floor, could have been incredibly interesting if the dancers had done anything with it, other than knock into it once or twice. Overall the work made for a disappointing evening, not so much because it was conceived from subject matter used so frequently but because the choreographer, who no doubt had an incredible amount to say about the subject, chose to say so little.